Enovate Systems’ Michael O’Sullivan and Stuart Ellison examine the US Bureau of Safety and Environmental Enforcement’s new well control rule and its implications for BOP casing shear rams. In April 2016, in response to recommendations of post-Macondo investigations     regarding safety and reliability during offshore drilling operations, the US Bureau of Safety and Environment Enforcement (BSEE) published its much anticipated well control rule. The rule imposes additional requirements on operators and drilling contractors in the following areas: documentary requirements; drilling operations; blowout preventer (BOP) design and system requirements; inspection, maintenance, repair and testing of BOPs. It is generally accepted that compliance with the new requirements present technical and operational challenges for the industry. More onerous requirements are imposed in the early planning stages of operations, in particular around the level of information and verification demanded by the regulator. What has increased is the burden of proof that the drilling equipment is fit for purpose to satisfy the requirements of the well design. The general requirements for BOP systems are broadly in line with API Standard 53 , which is regarded as a robust standard for the design and operation of well control equipment and is recognized as such by BSEE through incorporation into the rule by reference. Most requirements of the rule became effective 90 days after publication. Recognizing the inability of current technology to comply with all requirements immediately, BSEE has given the industry two years to enhance shearing capability; three years to implement real-time monitoring during drilling operations; five years to deliver enhanced subsea accumulation; and seven years to introduce technology capable of centralizing pipe prior to shearing. Enovate has carried out a detailed assessment of the implications of the rule on the shearing capability of existing casing shear ram (CSR) technology, specifically the requirement in clause §250.732(b) for the submission to a BSEE-approved verifi cation organization (BAVO), prior to beginning any operations requiring the use of a BOP, of shearing and sealing pressure calculations for all pipe to be used in the well including corrections for maximum anticipated surface pressure (MASP). This requirement is new. Previously, not all pipe had to be explicitly shearable and the MASP did not need to be considered when calculating shearing pressures and associated subsea accumulation volumes. BSEE is now demanding verified evidence of shearing pressures, and associated accumulation requirements, for all drill pipe bodies, tubing bodies and casing bodies. Because of the geology of the Gulf of Mexico, wells tend to have deep total vertical depths and high bottom-hole pressures (over-pressurized wells). This requires relatively heavy well architecture with 14in and 16in intermediate casing being widely used for such wells in the deep-water Gulf of Mexico. The requirements in §250.732(b) effectively changes the design basis for CSRs, potentially making many of them no longer fi t-for-purpose for wells that are completed with heavier intermediate casing sizes. To illustrate this point Enovate has calculated the shear pressures, and associated accumulation, required to shear Q125, 14.0in x 0.82in WT casing using two common CSR configurations, i.e., 22in and 28in operators with 5,000psi hydraulic control systems. The shear pressures are determined considering two wellbore conditions, i.e., 0psi and 15,000psi wellbore pressure. In addition, for these wellbore pressures the hydraulic accumulation required at 0ft, 4000ft and 12,000ft water depth is also determined. The results are presented in the table below. The 22in ram operator cannot cut the 14in casing under any wellbore condition as the shear pressure exceeds the available 5000psi control system pressure. The 28in operator can cut the 14in casing with 0psig and 15,000psig wellbore pressure. With 15,000psig wellbore pressure 4,221psi control pressure is required. The need to supply such a relatively high pressure leaves the accumulator system with a low usable volume (typically in the range 2-5%, depending on water depth). As the table shows, although the 28in ram operator can shear 14in casing the accumulation volume required to do so becomes impractical in deep-water. To shear the 14in casing at 12,000ft water depth and with 15,000psi in the wellbore will require ca. 100, 40gal accumulator bottles. For existing CSR technology, the calculations required by the rule will show that they will not be able to practically demonstrate the ability to shear all tubulars used to drill or complete a well that requires the use of large intermediate casing. Introduce 10,000psi control systems – The implications of such a change are two-fold. First, the increased pressures will require design changes to meet the increased structural loads, resulting in heavier shear rams. Second, the use of higher control system pressures means a further reduction in the available accumulation volume at depth, increasing the number of accumulator bottles required, which will in turn result in adverse impact on BOP size and weight. Increase operator size – In order to ensure that the required shear forces can be delivered using 5000psi control systems and practical accumulator volumes, it is necessary to have the ability to shear using relatively low control pressures, i.e., less than 2500psi. For current CSR technology, this means using a ram with an operator in excess of 40in. This could lead to a doubling in shear ram size and a quadrupling in weight. Well design – Another possible solution is to design wells within the BAVO verifi ed constraints of current well control equipment. This means that wells must be designed without relying on the heavier 14in and 16in casing sizes. This approach severely limits the number of casing points that could be set in the well and with BSEE also tightening the drilling margin (a tighter drilling margin requires more casing points, not less), getting creative with well design doesn’t appear workable. The impracticality of these options mean that existing drilling equipment will be rendered obsolete in much of the Gulf of Mexico and effectively usher in a partial drilling moratorium for any well designs that require the larger intermediate casing sizes. As more companies prepare applications for permits to drill under the new regime, it will become obvious that the operational theatre has narrowed dramatically and in order to develop the oil and gas resources of the Gulf of Mexico a new approach to well control equipment is required. The industry needs something that can shear and seal the heaviest intermediate casing bodies at the highest wellbore pressures, using existing 5000psi control system and that fi t within the footprint of existing BOP stacks. Fortunately, a range of technology capable of meeting these requirements is being actively developed. To comply with the rule’s requirements, and remain within the size and weight footprint of existing shear rams, will require a step change in casing shear technology with the ability to shear large (>_13.375in), high strength (125,000psi) casing; ability to shear the largest tubulars used in well control at relatively low control pressures, i.e., less than 2,500psi; ability to seal against a flowing well; capable of inherent self-centralizing of the tubular during cutting. Enovate has developed and qualified a shear and seal technology that meets these criteria, called En-Tegrity, which is fundamentally different to conventional ram technology because it comprises a dual gate valve with a reverse actuation method, meaning that the gates are pulled across the bore rather than pushed into it. This results in improved shearing capability and wellbore assisted closure; for the En-Tegrity, wellbore pressure increases the available shear force, unlike traditional ram technology. The En-Tegrity provides bi-directional metal-to-metal sealing. This feature facilitates improved sealing in a flowing well scenario as there are no elastomers in the bore that can be washed out. An 18.75in preventer based on the qualified En-Tegrity technology is under development and will be market-ready in 2019. The 18.75in En-Tegrity preventer will shear Q125, 14.0in x 0.82in WT casing at shear pressures of 2000psi (0psi wellbore pressure) and 1300psi (15,000psi wellbore pressure). The ability to shear at these relatively low pressures means that the hydraulic accumulation required by En-Tegrity is ca. 50% lower at 12,000ft water depth than for a 28in operator. In addition, a number of companies are actively developing electric actuators that are capable of delivering up to 4 million lbf. To put this figure in context, ca. 2.3 million lbf is required to shear Q125, 14.0in x 0.82in WT casing. Electric actuation is an attractive proposition because the power required to deliver this force is independent of water depth and can be delivered from the topside. In theory the size and weight that is contributed by accumulation systems can be removed completely from the BOP stack. In practice it will be necessary to have the ability to store sufficient energy subsea to deliver the required shear force in the event of loss of topside electric power. Nevertheless with electric storage technology improving all the time it is likely that a subsea electric storage system can be developed whose size and weight will be less than the equivalent subsea accumulator system. An electric actuator system could be retrofitted to existing BOP technology or incorporated into new technology such as En-Tegrity. The final BSEE well control rule will have a significant impact on BOP technology. The requirement of §250.732(b) (3) to demonstrate the ability to shear and seal all tubulars to be used in the well will be difficult for current ram-type BOPs to demonstrate with 5000psi control systems. Calculations will show that current CSRs cannot shear some commonly used tubulars, such as large intermediate casing, during well completion. The requirement to account for MASP will further reduce the cutting capability of ram-type CSRs. Enabling technologies are under development that will allow BOP systems to become rule-compliant. These include improved shear and seal technology that can deliver high shear forces at relatively low hydraulic control pressures, close and seal on a flowing well, and self-centralize the tubular during cutting. 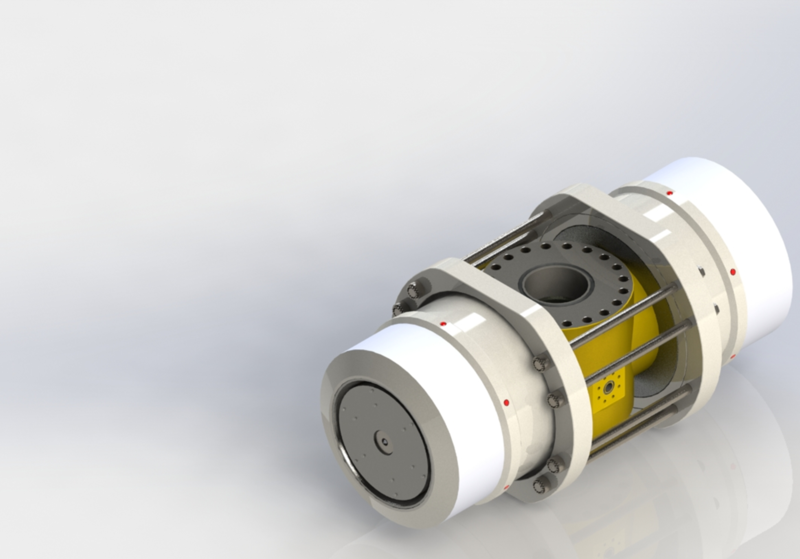 In addition, the prospect of an all-electric BOP that will render the requirement for subsea hydraulic accumulation redundant is edging closer with the development of electric actuators capable of delivering forces required to shear the largest tubulars.